Many schools are fingerprinting pupils without parents' permission, teachers have warned. It is thought around 100 schools in the UK now use fingerprint identification systems for registration, borrowing library books and cashless catering. But there is no legal requirement for schools to seek parents' consent for using biometric technologies. Critics say this is "outrageous" and have called for a "strong and explicit law" to cover this issue. 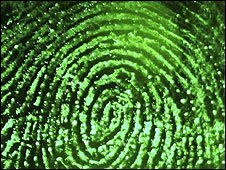 A spokesman for the Department for Children, Schools and Families says it was "common sense" for schools to consult parents about taking fingerprints. Schools also had to comply with data protection regulations, he said. But teachers have voiced concerns at a lack of adequate control over the taking of biometric information. Speaking at the Association of Teachers and Lecturers (ATL) annual conference in Manchester, teacher Hank Roberts said fingerprinting should not be allowed in schools without full consultation with staff and written permission from parents. Mr Roberts, from Copland Specialist Science College in Brent, London, said: "It's plain common sense for them to consult parents before introducing biometric systems. "It's outrageous that children's fingerprints can be taken without their parents' or guardians' consent." Azra Haque from Hay Lane Special School in Brent said schools should have to involve pupils and parents in any decisions to use biometric technologies. "We really do need a strong and explicit law in this regard,"she said. Mr Hanks cited the Capital City Academy in Willesden, London, which faced anger from parents after it fingerprinted pupils without their permission. Let's remember, it's schools using it, not the police." The school was subsequently forced to consult with parents and offer an opt-out for those who objected. Geoff Pye, a teacher from Essex, said fingerprint identification meant shorter queues at lunchtime and no problems with pupils losing swipe cards or having their dinner money stolen. "It's a very useful tool - schools will use biometrics usefully. Let's remember, it's schools using it, not the police." The union rejected Mr Hank's and Ms Haque's motion to raise the use of biometric technologies with Children's Secretary Ed Balls "as a matter of urgency" and oppose the use of these technologies, without full consultation, with strike action if necessary. But conference delegates agreed to set up a working party to "formulate a policy on the matter". Alex Thomas, principal of Capital City Academy, said: "Many parents, once they have seen the system in action, have supported the school in introducing the system. "Previously students were using (payment) cards, which could be lost or stolen. The biometric system prevents that happening and is much quicker. The Information Commissioner's Office (ICO), which promotes public access to official information, said it was not illegal for schools to collect pupils' fingerprints without their parents' consent. The ICO said there was nothing in the Data Protection Act that required schools to seek consent from parents before implementing a fingerprinting programme. But it said schools should be aware of the sensitivity of the issue. "It is important that the information is only used for purposes specified when it is collected," the ICO said in a statement. "Schools should explain the reasons for introducing the system and how personal data is used and kept safe." And it would be "heavy-handed" of schools not to respect the wishes of those pupils and parents who objected to fingerprinting initiatives, the ICO added. A spokesman for the Department for Children, Schools and Families said: "It is down to each school to judge best how to do their own day-to-day running. "But we've made clear that it is plain common sense for heads to consult parents about potentially sensitive issues like this. If parents want to opt out, then the school should listen to them and consider alternate arrangements. "Schools are well used to handling sensitive information like attendance registers, behaviour records and home addresses. They have to comply with data protection laws - meaning any personal data can only be used for its stated purpose; cannot be shared with third parties beyond it and it must be destroyed when a pupil leaves their school."